When you rez TMI, trace – if unsuccessful, derez TMI. A collection of cast-off cyberjunk. But it doesn't stay junk for long. A notoriously terrible piece of ice, TMI has been given new life by the introduction of Surveillance Sweep. Let's consider TMI without the Sweep first. Single-sub barriers have a pretty clear cost-to-strength ratio: Ice Wall, Wall of Static, Bastion, Fire Wall, and the upcoming Vanilla all have the same rez cost as their strength. So if your combined rez and trace cost is 5 credits or less, you're doing well as a corp. So imagine that you're Making News and you rez a TMI. You spend 3 on the rez, 2 from your ID, and 2 out-of-pocket. The runner then would have to pay through a trace strength of six to derez the TMI. But here's the thing: Every runner will do that, if able. Even if they have no link, spending 6 to force the corp to waste 5 is a pretty good deal: and it would take you at least 4 to get through TMI with Corroder anyway, so it's not even that much extra effort on the runner's part. 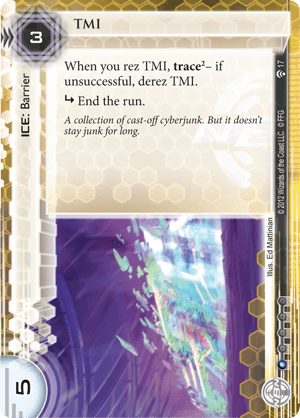 The only reason to run TMI instead of Bastion would be if you could guarantee that the trace would succeed every time for no extra money, or if are layering on trace attempts for ChiLo City Grid. Neither of those has ever been viable, so TMI has always been terrible. But all that changes when you have a Surveillance Sweep in play. Suddenly, the cost is put on the runner. The corp only has to put three credits up front, and then ask the runner--how much are you willing to spend on this? If the runner has zero link, then they have to pay 2 just to match the strength of the trace, at which point you can throw in a single credit. The result would be that you spend 4 rezing a barrier that's worth 5, and taxing the runner 2 at the same time, which is an amazing play. If the runner spends more than that, then the corp has two options. They can either match the runner credit-for-credit: rezzing a TMI for 7 is still pretty okay if you tax the runner 5 at the same time. But there's an even nastier play. Let the runner win the trace: you've lost the 3 you spent rezzing, and the runner has lost more than that. Then, immediately re-rez TMI--you're still in the same timing window. It gets even better if you have recurring credits from NBN: Making News or Primary Transmission Dish, or have boosted the strength with Rutherford Grid. (Sadly, Improved Tracers doesn't work, since TMI lacks the appropriate subtype.) You won't even have to spend the credits: the runner will just see the mountain they have to climb over and will surrender without a fight. If your deck already relies on Surveillance Sweep, put in TMI. I guarantee you won't regret it. This card is basically terrible. It essentially gives you the option to pay 3 to tax the runner 2. But it really is an opportunity for you to tax yourself for however much you are willing to put towards the trace to keep a 5-str barrier with a single subroutine, a shaper can midrun-install and Anarchs have cutlery; criminals can generate enough from an Account Siphon to make even an expensive break worth it, and 60% of the value of that card is keeping the Corp poor, so it's always worthwhile.